Leeds, MA ─ Soldier On has been awarded a $15,000.00 grant from Berkshire Bank Foundation, the charitable arm of Berkshire Bank, America’s Most Exciting BankTM. The grant will go towards the development of Soldier On’s Women’s Wellness Program, a program being implemented into the Soldier On women’s program to promote a holistic approach to recovery. “Berkshire Bank’s support of the Women’s Program Wellness Center shows a strong commitment to helping homeless women veterans reengage in living happy, hopeful, productive lives and playing an active role in their families and their communities, “ said Cindy Nolan-Liston, Soldier On women’s program supervisor. Soldier On is dedicated to providing housing and supportive services to homeless veterans. The $15,000.00 grant from Berkshire Bank Foundation will support the services and programs offered to the women veterans that Soldier On serves to assist them in living healthy lifestyles. The wellness center will focus on empowerment while aligning with Soldier On’s philosophy of peer managed housing and programs. Yoga, meditation, stress management, peer support and nutrition are among the programs that will be available to the women at the center. Berkshire Bank Foundation aims to strengthen and improve the quality of life in the communities served by Berkshire Bank. By funding programs, like Soldier On women’s wellness program, that significantly impact the people they serve, Berkshire Bank works to support and strengthen the community. “Berkshire Bank is excited to provide this financial support to Soldier On so that they can continue to help formerly homeless veterans live in dignity. This innovative approach and program will help women veterans reengage with society and play an active role in their communities. There is no greater honor for us as a company than to give back to those who have served our country” said Peter J. Lafayette Executive Director of Berkshire Bank Foundation. John Downing has file folders full of statistics at his disposal as he talks about the many programs being carried out by Soldier On and the philosophy that powers the organization — from the percentage of veterans it serves who have mental health issues (78%) to the average hourly wage being earned by the many formerly homeless veterans now working for the agency ($10.89). But perhaps the most powerful — and poignant — numbers are these: There are more than 265 ‘residents’ of the homeless veterans shelter and transitional facility in Leeds, where the organization is based, and only about 25 of them went ‘home’ — whatever and wherever that is — for the holidays last December. He did that in what seemed like a few months — although it actually took the better part of a year to complete a full turnaround, thanks to some dramatic changes in the basic approach taken. And looking back over what’s happened since, success with that goal might be considered perhaps his most modest accomplishment. Indeed, Downing has been able to blueprint and implement a number of innovative programs and services, all designed with the Soldier On slogan — ‘changing the end of the story’ — firmly in mind. The most intriguing, and celebrated, of these to date is an initiative that provides veterans with the opportunity to transition from homelessness to home ownership through a unique program that enables them to purchase an equity stake in their homes. 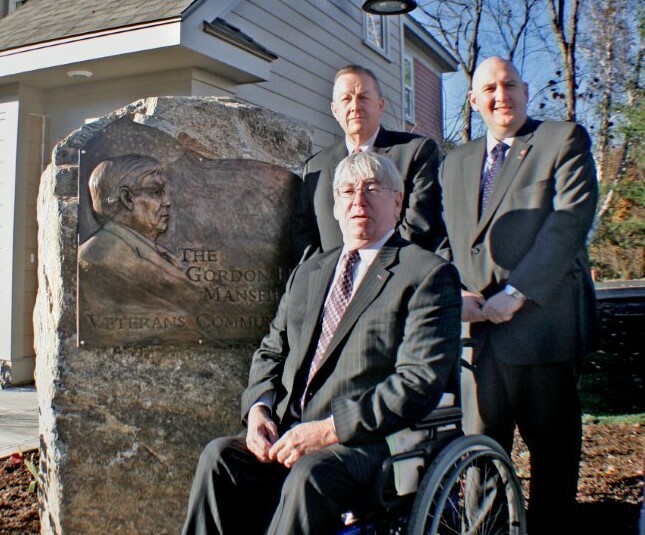 The Gordon H. Mansfield Community in Pittsfield, where more than 40 veterans now own their own condos, has become a model being emulated around the country, and Soldier On is planning several similar projects in this area, in communities ranging from Northampton to Agawam. But there is much more to the Soldier On story, including a unique and comprehensive veterans outreach program that includes case-management and referral services and temporary financial assistance involving everything from daily living activities to transportation to child care. There’s also a full roster of employment services — a key component in any individual’s struggle for financial independence — that include interview skills, money management, résumé building, training and education, and transportation. And there’s also something called the Veterans Justice Partnership, created with the purpose of developing service and treatment options and, where appropriate, alternatives to incarceration. And while compassion is the primary driver of these programs, there is a practical side as well: some of those aforementioned statistics show that, while the VA is projected to spend $400,000 to $500,000 on a 54-year-old veteran over the rest of his or her life, in the Soldier On model, that cost drops to $150,000. Overall, it’s not just what Solider On does that’s so impressive and makes this organization and its leader a Difference Maker, but also how. Its model is founded on the quality of social interaction amongst veterans, and it brings services to them instead of the other way around, while giving them the means to succeed rather than criticizing them when they don’t. For this special section profiling our Difference Makers, we talked at length with Downing about how this approach came about and why it has become so successful in positively impacting quality of life for veterans. He wanted to introduce them and have them explain what they do and how, but he also wanted to display the great deal of pride he has in the team he’s assembled, the work it’s doing, and the intriguing approach it’s taking, which he explained in direct, colorful language. And as he elaborated, he ventured back to the weeks and months after he came to the then-7-year-old Soldier On, the latest in a series of assignments within the broad realm of social service and, especially, reintegration and after-care services. He found an organization, started by some homeless veterans and employees of the VA hospital, that was functioning at about 40% capacity, had been poorly managed, and was essentially ready to be shut down by the VA.
His work to create that Holiday Inn he spoke of started with cleaning the buildings, replacing dilapidated furniture, and making sure the residents had decent meals and clothing. And then, the real work started. By that, he meant changing and improving the way veterans were administered services and altering the basic approach taken by the staff. It was no small change. “Most of us, as Communist-trained social workers, spend most of our adult lives learning how to tell people what to do,” he noted. “We tell people how to get into recovery, what steps they have to take, and what kind of financial planning they need to do. And we know how to tell them how to change their decision making. behavior rise up, just tell me what to do — and I’ll show you just what I’m not going to do. And I realized we spent a lot of time doing things that way, so I tried to figure out how to bring about change, because everyone in the recovery business, everyone working with homeless people, have all these rules and regulations that they like to enforce. stay here, and that was quite different from what everyone else does in this world,” he went on, adding that another radical idea came to him — having the staff essentially take responsibility for the failures of those they’re serving. This approach essentially changed the conversation, he said, from asking why they did certain things to asking what the staff could do to help them make better choices. That’s a fundamental change in philosophy that has had tremendous results. “What we saw when we did that was that our number of intakes went from 1,025 for the 265 beds down to to 401,” he noted, adding that another major change was to either bring services to where those needing them lived — or bring them to the services. • They require not only counseling and treatment, but education, employment training, and individual case-management services, all on an ongoing basis. And when an agency can succeed in doing all that, many things are possible in that broad realm of helping veterans define — and achieve — things that are meaningful to them. Nowhere is this more evident than with the program to transition homeless veterans into what amounts to home ownership. And for the inspiration to take Solider On into this realm — what certainly amounted to uncharted territory and a tangled web of bureaucracy and funding programs — he returned to 2005 and a speech delivered by Army Maj. Ed Kennedy from the Joints Chiefs staff as the project in Pittsfield was being announced. The rest, as they might say, is history in the making. And it’s been an intriguing, often difficult ride — Downing knew next to nothing about housing at that time, and had to endure a challenging learning curve involving something called limited-equity co-op apartments. He saw a few models, mostly faith-based, in Minnesota and New York City, and took these concepts to a property he acquired in Pittsfield. The working model calls for individuals to buy an equity share in a complex (there are 39 units in Pittsfield, and thus 39 shares), and that share entitles the individual to rent an apartment. Soldier On provides Internet, cable, and 20 meals a month in a dining facility on the campus to help enable veterans to live in the complex on their limited incomes. “It’s a model that really works — it ends homelessness for veterans, and it ends long-term care for veterans in the Veterans Administration system,” he said, adding that the win-win-win nature of the concept (there are also real-estate taxes to be gained by the community in question) is generating considerable interest in new projects. There are 44 units planned for the VA complex in Leeds ($6.2 million has been secured from the VA to build it), another project is planned for the former police training facility in Agawam, and more plans are coming to the drawing board across the country. And while housing is certainly a huge part of the equation, there are many other ways in which Soldier On is helping to change the end of the story. Another is through direct employment — there are now just over 100 people on the Soldier On payroll, and 74 of them are formerly homeless veterans — and helping enable clients to enter and succeed in the job market. Through the Homeless Veterans Reintegration (HVRP) program, funded by the U.S. Department of Labor, the agency provides veterans with the tools and support necessary for employment, said Downing, adding that this includes maintaining relationships between veterans and area employers. There is also a greater emphasis on outreach, he continued, as well as on the recently instituted Veterans Justice Partnership, an alternative-sentencing program, involving the four western counties, for veterans who wind up in the court system. In a nutshell, the program was created to provide veterans with access to information, resources, and programs to help them make positive transitions and lead productive lives. “We’re in all four western-county jails every week with our staff, meeting with the veterans in jail, running groups, and helping them do their exit planning,” said Downing. “It’s another example of how go where the veterans are, we serve them, and, in this case, we try to prevent them from winding up there. “The earlier you can intervene, the more effective you can be, and the costs go down,” he continued, adding that this sentiment applies not only to the justice partnership, but also to every Soldier On endeavor, and it goes a long way toward explaining the organization’s track record for success. When it was explained to those veterans who would soon be living in the Gordon H. Mansfield Community in Pittsfield that they would become taxpayers, Downing recalled, some responded with tears. “They would say to me, ‘Jack, I never thought I could do this again — and I’m so grateful that I can do it,’” he told BusinessWest. For making it possible for such individuals to give back to the community in such a different and rewarding way, and for truly changing the end of the story in so many positive ways, Downing and the entire staff at Solider On are more than worthy of the title Difference Maker. ALBANY – BBL Hospitality donated truckloads of their gently used furniture to Soldier On’s new Albany County Veterans Resource Center. Located at 55 Heritage Lane in Colonie, the center provides case management and supportive services to local veterans. The non-profit organization Soldier On has already served 1,052 New York veterans and their family members through two $1 million Supportive Services for Veteran Families grants. Soldier On provides case management and supportive services to veterans that include temporary financial assistance for rent, security deposits, moving costs, childcare, and emergency supplies. Soldier On also helps veterans obtain Veterans Administration benefits and transportation. The furniture donated was made available by recent renovations of the Residence Inn in East Greenbush. REVERE – February 7, 2013 – Continuing the Patrick-Murray Administration’s commitment to improving housing infrastructure to support growth and opportunity throughout the Commonwealth, Secretary of Housing and Economic Development Greg Bialecki today announced $67 million in affordable housing resources and tax credits for 23 developments in 21 communities. The announcement of the funding was held at 525 Beach St. in Revere, where 30 new units of low-income housing, including six units for extremely low-income families, will be built with the support of $2.2 million in federal and state tax credits and housing subsidies, and will create 57 jobs. In all, the 23 projects across Massachusetts will create 1,326 units of housing and an estimated 1,710 construction jobs. The $67 million investment includes more than $9 million in federal low-income housing tax credits, $7.7 million in state low-income housing tax credits, and $47.7 million in state and federal housing program subsidies. Of the 1326 units, 1,164 will be affordable to low- and moderate-income individuals and households, with 298 units reserved for extremely low-income families, including those making the transition from homelessness. In November, Governor Patrick announced a goal of creating 10,000 multi-family units of housing per year, the first production goal of this kind set by any state in the country. Increasing market-rate housing for families and individuals is part of the Patrick-Murray Administration’s comprehensive plan for improving housing at all levels. Along with creating new housing, the Administration has made significant investments in the Commonwealth’s public housing stock, by preserving and improving the 46,000 housing units in the system through increased capital funding, increased operating subsidies, and changes in management of those resources. Since 2009, Governor Patrick and Lieutenant Governor Murray have worked with the Legislature and Congress to direct over $700 million in federal and state tax credits and state housing program subsidies to projects that improve the state’s affordable housing, create jobs and build stronger communities. These investments have generated more than 14,000 jobs and 10,000 housing units; 9,000 of which are affordable. Village Green Phase I, Barnstable: Dakota Partners will use $2,250,000 in DHCD housing subsidies and $1,360,000 in federal and state Low Income Housing Tax Credits to produce 60 units of affordable family housing. The project is expected to generate 87 jobs. Jackson Commons, Boston: Urban Edge Housing Corporation will use $2,940,000 in DHCD housing subsidies and $910,094 in federal and state Low Income Housing Tax Credits to produce 37 units of affordable family housing. The project is expected to generate 114 jobs. MHNHS Roxbury Crossing Senior Building, Boston: Mission Hill Neighborhood Housing Services, Inc. will use $2.8 million in DHCD housing subsidies to create 39 units of affordable elderly housing. Twenty units will be reserved for extremely low-income individuals or households. The project is expected to create 85 jobs. St. Kevin’s Residential, Boston: The Planning Office for Urban Affairs will use $2,708,806 in DHCD housing subsidies and $768,950 in federal Low Income Housing Tax Credits to redevelop a former school building and build 33 units to serve families who are homeless or at-risk of homelessness. Services will be provided by St. Mary’s Center for Women and Children. The project is expected to produce 85 jobs. Residences at Centre and Main – Phase 1A, Brockton: Trinity Financial will use $2,378,000 in federal and state Low Income Housing Tax Credits and $1,750,000 in DHCD housing subsidies to produce 71 units of housing, with 21 units restricted as affordable. This project is the first of several Trinity projects that will result in the redevelopment of the Enterprise Block in downtown Brockton. This project is expected to create 244 jobs. Chapman Arms, Cambridge: Homeowner’s Rehab, Inc., DHCD’s designee under the Chapter 40T preservation statute, will use $1.975 million in DHCD housing subsidies and $236,868 in federal Low Income Housing Tax Credits to preserve 25 units of affordable family housing for low-income households. Chapman Arms is expected to create 29 jobs. Choice Veterans Housing, Chelmsford and Westford: CHOICE, Inc. will use $1.62 million in DHCD housing subsidies to develop 13 units of rental housing for veterans on two different sites – one in Chelmsford (new construction) and one in Westford (rehabilitation). The project is expected to create 23 jobs. Standard Box Apartments, Chelsea: Mitchell Properties will use $1,550,000 in DHCD housing subsidies and $366,000 in federal Low Income Housing Tax Credits to build 21 new affordable units and 29 additional apartments in the Box District in Chelsea. The project is expected to generate 73 jobs. Parsons Village, Easthampton: The Valley Community Development Corporation will use $2,533,234 in DHCD housing subsidies and $1,084,988 in federal and state Low Income Housing Tax Credits to produce 38 units of affordable family housing. The project is expected to produce 71 jobs. Edmands House, Framingham: Beacon Communities will use $2,933,388 of federal and state Low Income Housing Tax Credits and $1,000,000 in DHCD housing subsidies to preserve 171 units of affordable housing in this 190 unit development in Framingham. This project is expected to generate 87 jobs. Chestnut Park, Holyoke: Weld Management will use $1,694,534 in DHCD housing subsidies and $990,000 in federal Low Income Housing Tax Credits to redevelop a former school complex in downtown Holyoke into 55 new units of affordable family housing. The project is expected to produce 104 jobs. Counting House Lofts, Lowell: Winn Development will use $2,012,792 in federal and state Low Income Housing Tax Credits and $2,000,000 of DHCD housing subsidies to develop a former mill into 52 housing units of housing, including 26 affordable units. This project is expected to create 116 jobs. Marion Village Estates, Marion: Baywatch Realty Trust will use $2,715,000 in DHCD housing subsidies and $989,470 in federal Low Income Housing Tax Credits to build 60 new affordable family apartments in Marion. The project is expected to produce 93 jobs. Mashpee Village Phase II, Mashpee: The Community Builders, Inc. will use $1,000,000 in DHCD housing subsidies and $493,762 in federal Low Income Housing Tax Credits to renovate and preserve 145 units of family housing in Mashpee. The project is expected to produce 79 jobs. Leeds Veterans Housing Cooperative, Northampton: The non-profit Soldier On, Inc. will use $1.844 million in DHCD housing subsidies to create 44 units of limited equity cooperative housing for formerly homeless veterans. The project is expected to generate 60 jobs. Central Annex/Union Court, Pittsfield: The non-profit Preservation of Affordable Housing (POAH) will use $2.75 million in DHCD housing subsidies and $380,512 federal Low Income Housing Tax Credits to preserve 101 units of affordable housing for families and seniors, with eleven units reserved for extremely low-income families. The project is expected to create 37 jobs. 525 Beach, Revere: The Neighborhood Developers will use $710,629 of federal Low Income Housing Tax Credits and $1,520,261 of DHCD housing subsidies to develop 30 units of affordable family housing on the site of a former warehouse. This project is expected to create 57 jobs. Old Farm Inn, Rockport: The non-profit Supportive Living Inc. will use $600,000 in DHCD housing subsidies to create eight units of affordable housing for persons with disabilities. The project is expected to create nine jobs. Outing Park Apartments I, Springfield: First Resource Development Company will use $3,550,000 in DHCD housing subsidies and $1.2 million in federal and state Low Income Housing Tax Credits to acquire and renovate 94 existing family housing units. The project is expected to produce 119 jobs. Saint Joseph’s Hall, Watertown: Metro West Collaborative Development, Inc. will use $1,663 million in DHCD housing subsidies and $153,243 in federal Low Income Housing Tax Credits to preserve 25 units of affordable housing, with 20 units reserved for extremely low-income households. The project is expected to create 23 jobs. Sitkowski School, Webster: Neighborhood of Affordable Housing will use $1,275,361 in federal and state Low Income Housing Tax Credits and $2,715,000 in DHCD housing subsidies to develop 66 units of affordable senior housing. This project is expected to create 125 jobs. Haydenville Village Center Apartments, Williamsburg and Chesterfield: The Hilltown Community Development Corporation will use $2.892 million in DHCD housing subsidies to preserve 24 units of affordable housing, with 6 units reserved for extremely low-income households. The project is expected to create 17 jobs. Winthrop Apartments, Winthrop: Chelsea Jewish Foundation and Affirmative Investments will use $1,133,200 in federal and state Low Income Housing Tax Credits and $1,550,000 in DHCD housing subsidies to develop 40 senior housing units, including 37 affordable units. This project is expected to create 55 jobs. PITTSFIELD — Distinguished veteran and veterans advocate Gordon Mansfield, the namesake of Pittsfield’s Soldier On facility for homeless veterans, died on Jan. 29 due to aortic disease at the Veterans Affairs Medical Center in Washington D.C. He was 71. A Pittsfield native, Mansfield left the Berkshires when he was 14 after his father got a job in New Jersey, according to a friend. In the years to come, he would earn his law degree and serve two tours in Vietnam, where he was wounded near the spinal cord, an injury that put him a wheel chair for the next 45 years. Despite the physical challenge, he would go on to become the deputy secretary of the U.S. Department of Veterans Affairs from 2004 to 2008. He wouldn’t forget his hometown during his ascent through Washington, D.C. He would become an invaluable liaison for veteran support nonprofit Soldier On, said Soldier On President and CEO John Downing. Downing said Soldier On probably wouldn’t be providing housing for veterans had it not been for Mansfield’s inspiring words: that the veterans who enlist in the military are all openly stating that they would be willing to die on his behalf. “It changed my whole understanding about what I needed to do help veterans,” Downing said. Downing, who first met Mansfield in 2003 and remained friends until he died, said that Mansfield was an invaluable liaison between the government and Soldier On, even after he retired. Downing said that all Soldier On facilities are scheduled to bear Mansfield’s name. He also said the success of the organization was largely attributable to Mansfield. No matter how far he’d come in life, Gordon Mansfield’s second wife, Linda, said the accolades didn’t matter: her husband always attributed the success to others, including to herself. Friends say that one of Mansfield’s proudest achievement was marrying Linda. Over the course of his career, Mansfield held a senior poition at the Department of Housing and Urban Development from 1989 to 1993 and then served as the executive director of Paralyzed Veterans of America from 1993 to 2000. Before becoming deputy secretary of the Department of Veterans Affairs, he was assistant secretary of congressional and legislative affairs for the department. During his military career, Mansfield was recognized with combat decorations a Bronze Star and two Purple Hearts, along with others. He was an early advocate for the disabled assisting with the legislation that became the Americans with Disabilities Act, according to his wife. Mrs. Mansfield said contributions on behalf of her husband should be made to the veteran support groups Fisher House, Wounded Warrior Project, Paralyzed Veterans of America, or Soldier On.